Happy Halloween! The day has arrived! Pumpkins, ghosts, goblins, and who knows what else may be gracing our doorsteps tonight for Halloween. Get your candy ready! While C is obviously too young to go Trick-Or-Treating this year, I still wanted to get into the spirit to commemorate the occasion of his very first Halloween. Our neighborhood doesn't have many kids, so it will be interesting to see if we have any costumed visitors come knocking tonight. As you can tell by the blurry photo above (it never fails...every time that GIANT smile comes out, my photos don't turn out), C is beyond excited to celebrate Halloween either way! In preparation for the day, we've been reading Five Little Pumpkins and Room On a Broom on a daily basis for the last week or so to learn all about Halloween. We haven't yet carved a pumpkin, although T is adamant that this happen so we can make some delicious Roasted Pumpkin Seeds to munch on over the weekend. We'll have to see about that. Separating pulp from pumpkin seeds is a project I'm not exactly sure I'm terribly interested in spending time doing this evening. Making these yummy looking healthy candy corn snacks, however, might be just the right amount of festiveness. Don't these look delicious!? 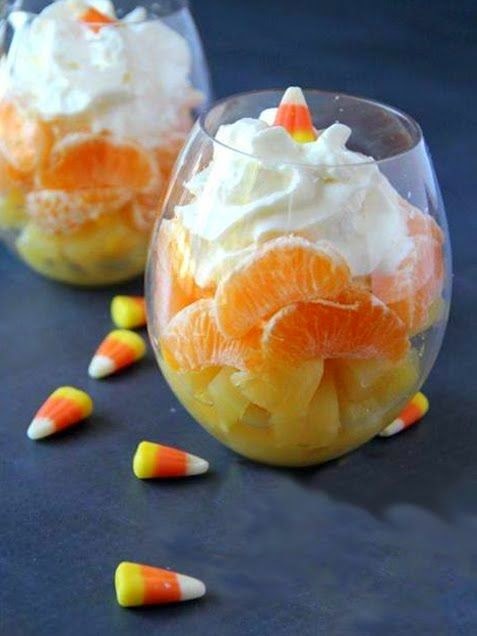 I don't like candy corn at all, but this healthy fruit version is calling my name! Heck...maybe I'll even convince T to whip up something Halloween-y from the bar after C calls it a night. There's got to be a pumpkin or candy corn themed cocktail recipe out there somewhere right?! Happy Haunting from our little munchkin! Ahhh...fall is officially in full swing. 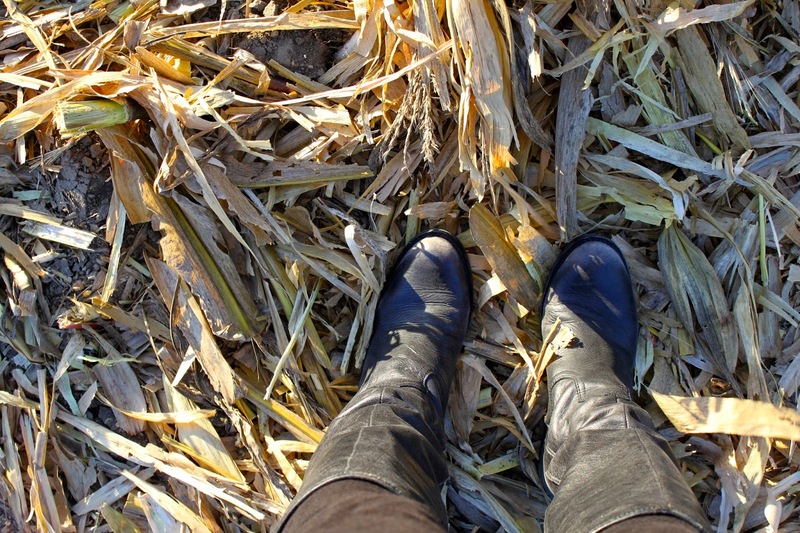 Along with the beautiful fall foliage, hunting season, cozy sweaters, and bonfires, another key component of fall in the midwest is harvest season. 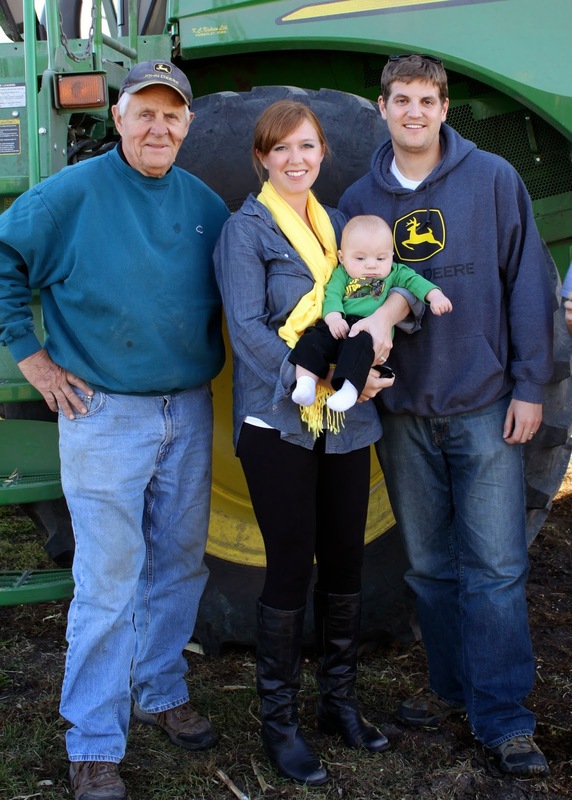 If you find yourself like us, traveling to and from football games most weekends, you've probably noticed the many farmers in the fields harvesting crops, baling, and getting everything ready for the next planting season. 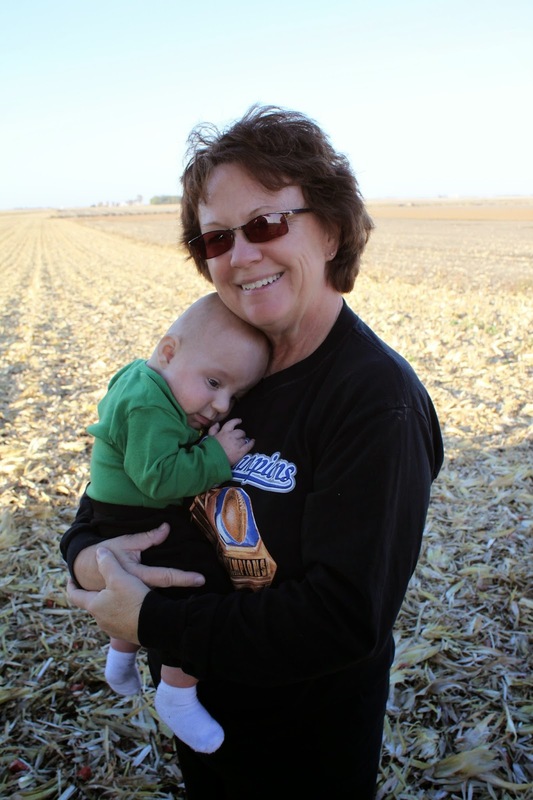 After a sprinkling of John Deere visits, the Clay & Humboldt County fairs, and reading about Johnny Tractor and Corny Cornpicker over the past several months, it was inevitable that C would want to get out in the fields for the first time this fall to see what it was all about. My family has an extensive background in all things farming...not to mention a strong affinity towards the color green (seriously though, the first color associations I had as a child were green means good and red means junk), so when the combines started going, it was only a matter of time until we took a little road trip to see what C thought of the real deal. Before any serious farming, Great Grandpa K (yes, of K.C. 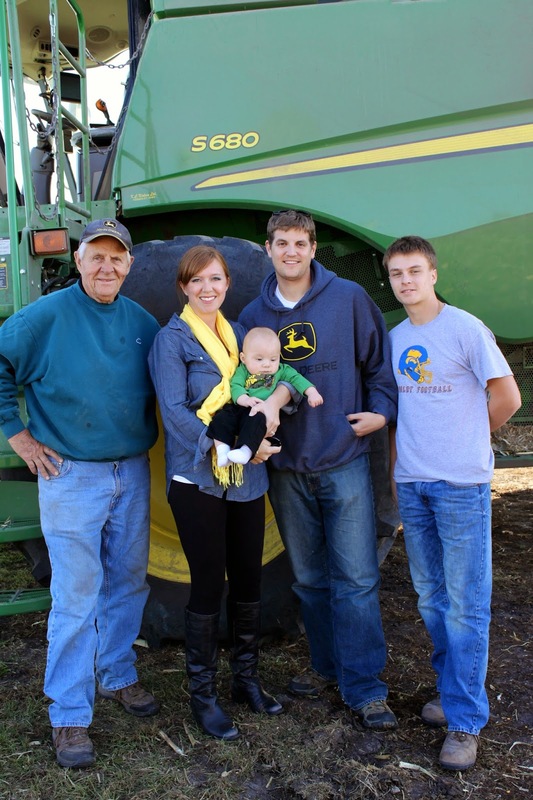 Nielsen Ltd.) took a little time to chat with C about how combines work. 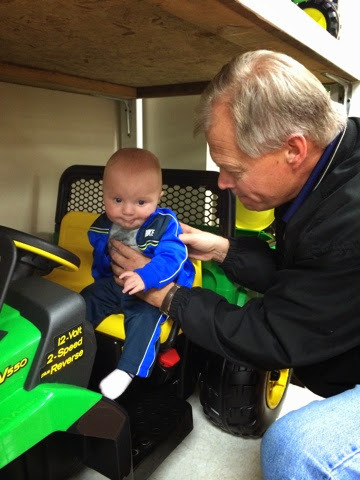 He learned all about how to drive, read the yields, and operate the corn head. As you can tell, C was eating it up, and completely fascinated by the whole ordeal. 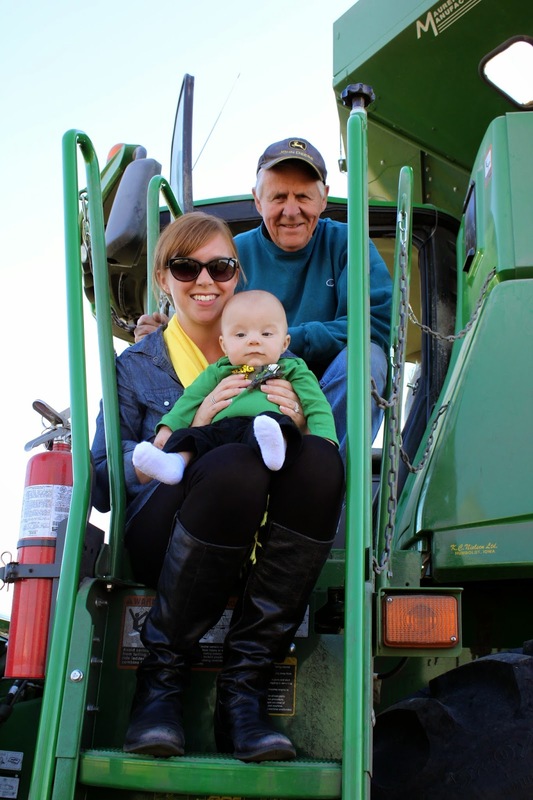 One of my favorite memories of my grandpa when I was little was going out for a ride in the combine during harvest, and I'm so glad that it is a memory that C & I can share. 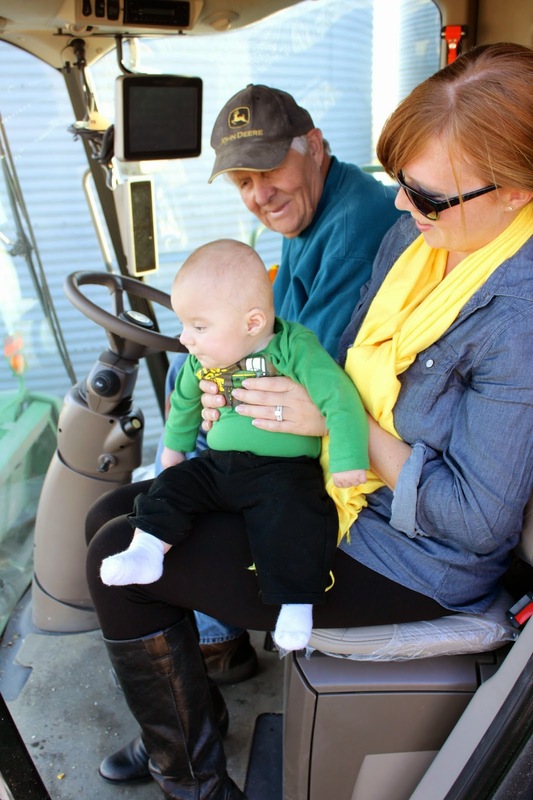 Taking C for his first combine ride was a very momentous occasion that I'm sure will be repeated on a yearly basis. I imagine next year he will find it even more interesting to watch as the corn and beans are harvested! Thanks to Grandma J for being our photographer for the occasion! As we head into our six month with baby (yikes! ), I thought I'd share a list of favorites from the last two months. 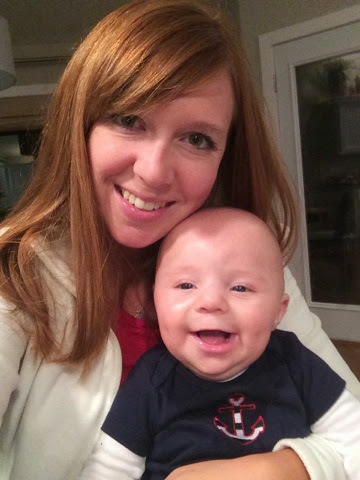 Without further adieu...our four and five month favorites. Comotomo Silicon Baby Teether & Sassy Teething Tail Fish // Hand-eye coordination had a drastic improvement during months 4 and 5, and C has loved nothing more than having something to chew on now that he can find his mouth. After trying several different teethers, the Comotomo Silicon Baby Teether and Sassy Teething Tail Fish have been our favorites. Both are easy for baby to grab from all angles and bring directly to his mouth to chew on. They are both soft and have different textures to explore. Footed Pajamas // With the cool down in temps lately, footed pjs are absolutely necessary. Offspring makes some that use a heavier weight cotton that work great for cooler temps, and hold up well with many washings. Bonus if you find some that are zippered instead of buttons! 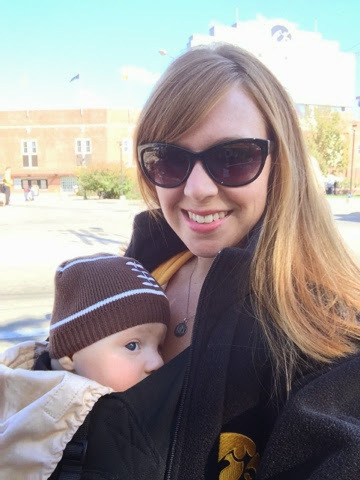 ErgoBaby Carrier // We love the Ergo! After baby hit that four month mark, he was too heavy to wear in the K'tan for extended lengths of time, but the Ergo has a lot more structure and better weight distribution with padded shoulder straps to help save mama's back. 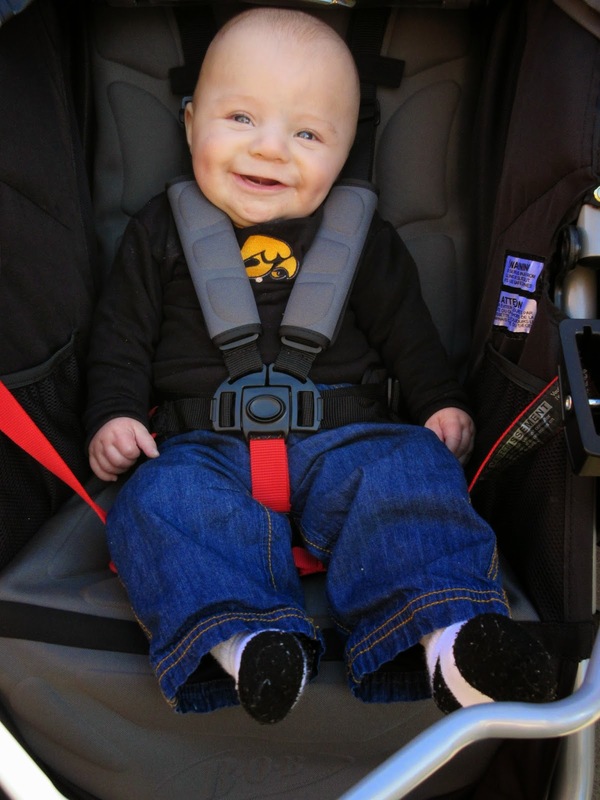 C goes in the Ergo on grocery shopping trips, football games, when I'm making dinner, and everything in between. 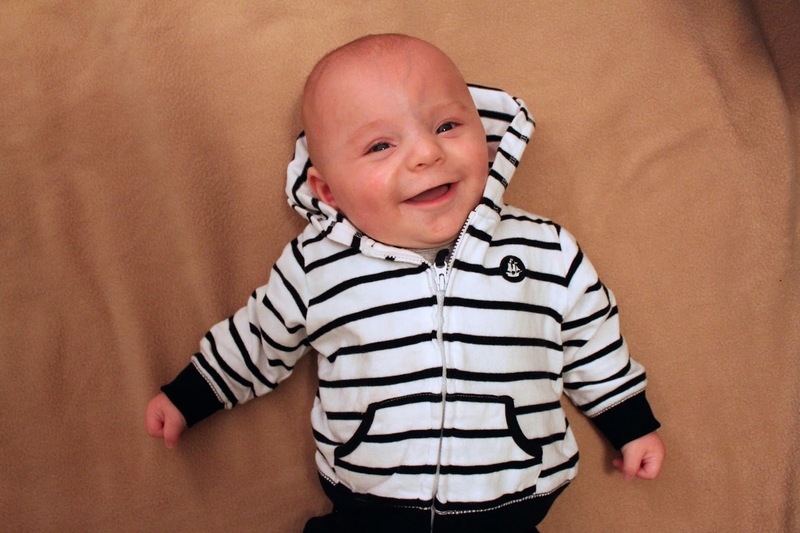 The fabric melds to baby's body, and cocoons him against me...perfect for little snuggle monsters! The Ergo can be worn on the front, side, or back, and is made for kids from 7-45lbs. 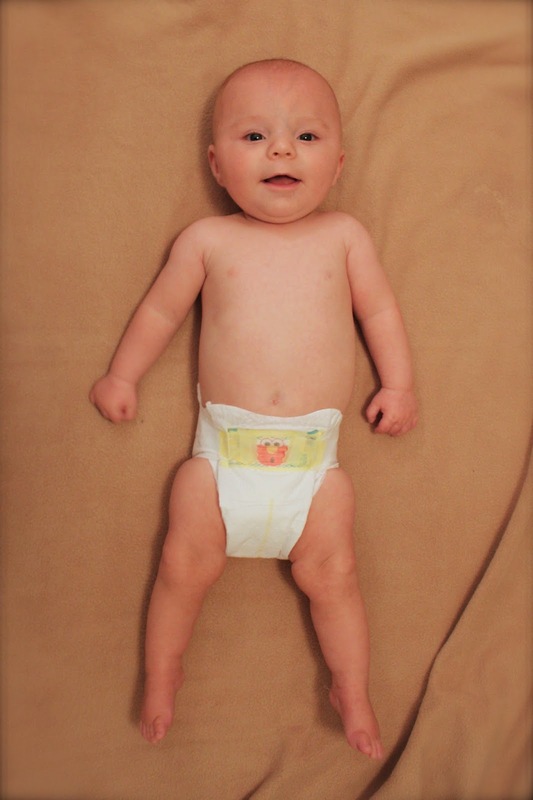 The recently released Ergo360 allows baby to also be worn forward facing. Oatmeal // Around the 5 month mark, we started giving C oatmeal. 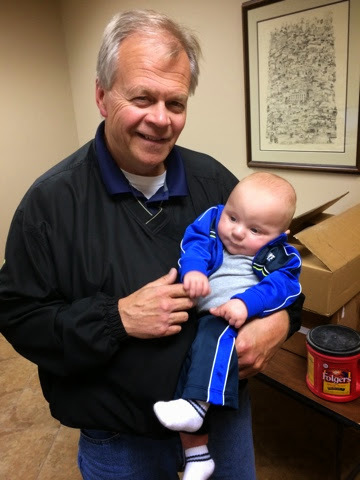 While he wasn't acting any more hungry than usual (a sign it's time to introduce solids), our Doctor recommended starting him on oatmeal since recent studies have shown decreased likelihood of allergies the sooner solid foods are introduced. 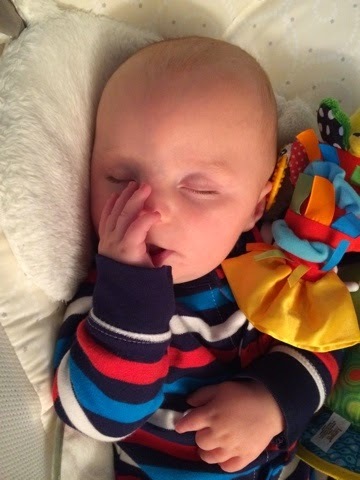 While T isn't fully on board with that thought, after seeing our little guy smack his lips and watch us like a hawk at dinner night after night, we thought why not? Ever since, C has been loving his oatmeal. 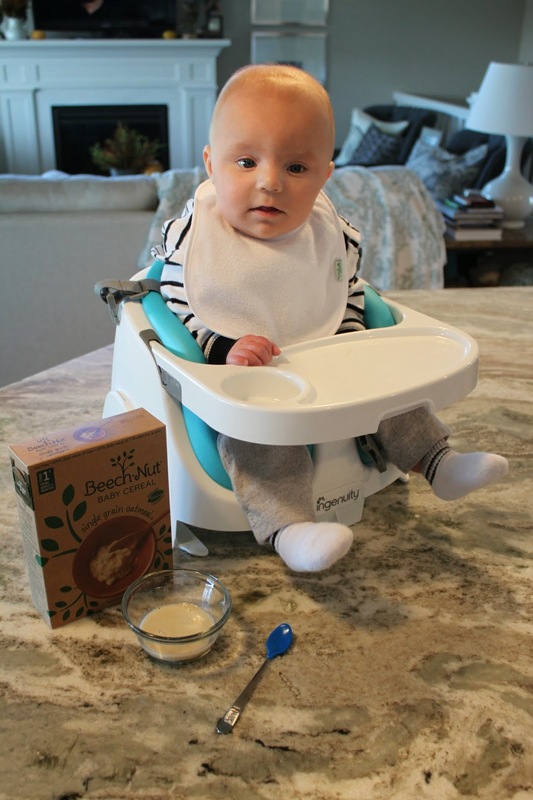 We've tried both the All Natural Beechnut and Organic Gerber brands, and don't think it seems to matter which one. I usually choose whatever has the least amount of ingredients. Oatmeal is oatmeal is oatmeal. There is no reason to have a bunch of extra additives. As for the whole rice vs. oatmeal dilemma, I never even considered giving C rice cereal. I pretty much viewed it as worthless for its extreme lack of nutrition and flavor, so after our Doctor gave the OK for skipping over rice cereal straight to oatmeal, we were all hands in. Prune Juice // Since the introduction of oatmeal, our little man has been seriously backed up if you know what I mean. Prune juice to the rescue. Strangely enough, he seems to like the oatmeal even more with the addition of prune juice. Win win. Check the baby food aisle for smaller portion sizes of prune juice before you resort to the expensive giant jug that you'll only use a few tablespoons from. BabyBjorne Soft Bibs // After a couple weekes of cloth bibs, and endless laundry, I discovered these soft plastic bibs, and I haven't looked back. Cloth bibs are great for liquid only diet, but with the introduction of oatmeal, these plastic bibs are so nice and keep cleanup quick and easy. Aveeno Baby Daily Moisture Lotion // Due to all of the drooling around here, a daily moisturizer has been key to help prevent dried skin. Depending how dry things get, we use Aveeno or Aquaphor around baby's nose and chin on a regular basis. Fleece Bunting & Stocking Hat // A warm fleece bunting is a must for chilly days. 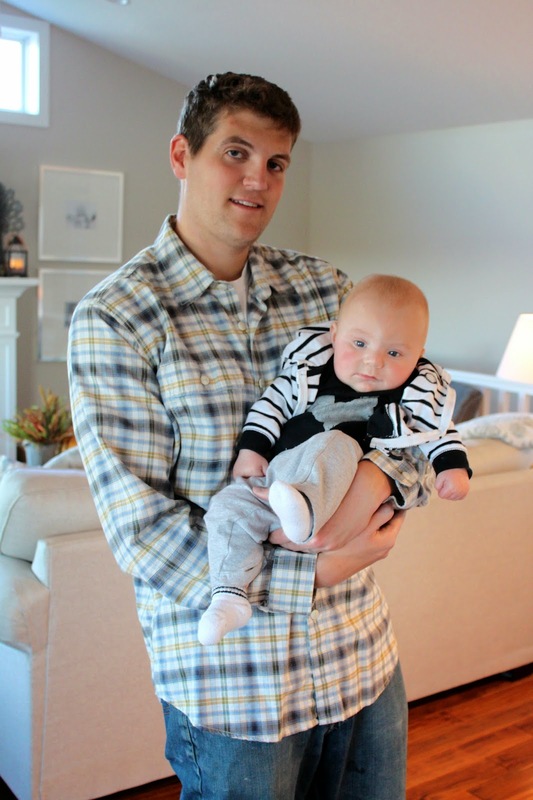 There are many different styles and brands to choose from - Carters, Columbia, Patagonia, etc. I plan to use ours during the winter as well so that I don't have to worry as much about baby overheating in a big snowsuit when we're on longer road trips. Well, month four officially went by in a blur! Maybe it's because I waited to do the month four update until after the official checkup, but seriously...where has the last month gone?! 7:30-8:30a.m. : C wakes up for the day and after about 15-20 minutes of babbling, reaching for his toes, and sucking his thumb, he's ready to have breakfast. After breakfast, he usually plays on his activity mat for about an hour or so, then sits with me for another half hour before going down for a nap...hopefully in his crib...for about an hour. 11:30a.m.-12:30p.m. : Lunch time! 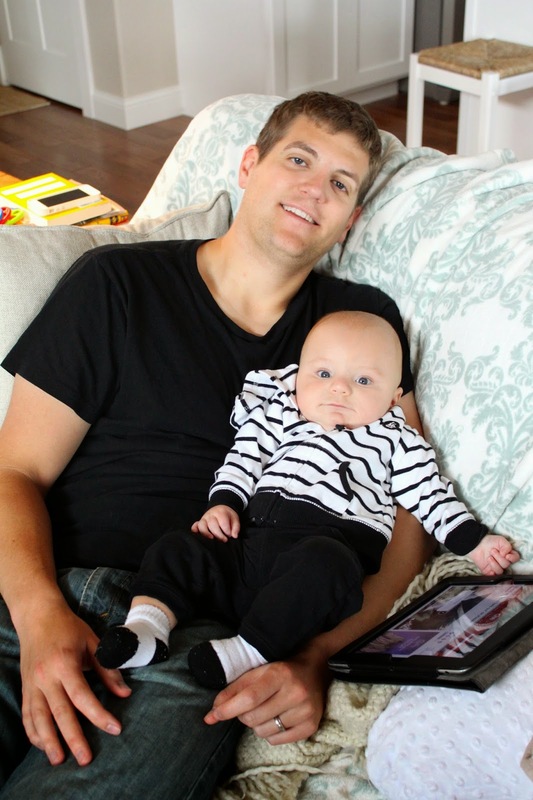 After getting a meal, C & I usually try to get outside for some fresh air and exercise, or run some errands if the weather isn't cooperating for outside time. C is usually pretty content to ride along in his car seat in the shopping cart, and enjoys looking at the fluorescent lights and everything on the shelves at the store. If we are outside, I try to choose a walking route were he can look at the trees he is so fascinated by. He'll usually sneak in a catnap during the afternoon as well. 3:00-4:00p.m. : Mid afternoon meal! After eating again, we play on the floor and work on rolling or tummy time followed by story time. If it's a bath day, it usually happens in the afternoon before T gets home since he never wants to participate. After all this, C usually sits in his Rock'N'Play and watches as I get dinner ready. 6:30-7:30p.m. : C is usually ready for dinner at just about the same time that T walks in the door from work or we are trying to sit down to eat dinner. Since T rarely gets home at the same time on a daily basis, it's easier to let C determine our schedule than try to plan dinner for a set time every night. Thank goodness for the 'keep warm' feature on our oven, slow cooker meals, and soup season! 8:00-8:30p.m. : C is ready for bed. If he had dinner on the earlier side, I'll feed him again, otherwise after pjs and a diaper change, off to bed for the night! He's been a great little sleeper, and will sleep through the night until we start the routine over in the morning. C has more personality than ever, and has become as T likes to say...a lot more fun. 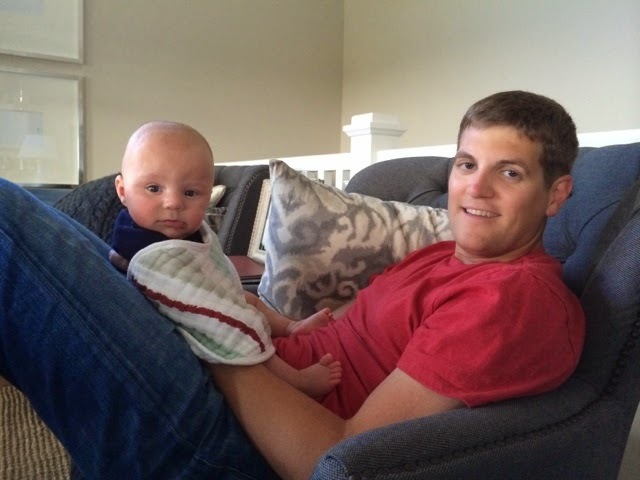 While I have always thought that C was fun, I can agree that the baby babbling, sucking on toes, and his general temperament have become more entertaining to be around in this last month. He still isn't too active yet, and thoroughly enjoys some solid snuggle time with me throughout the day, along with being nestled in Dad's arm at night watching football together or reading a book on the floor. 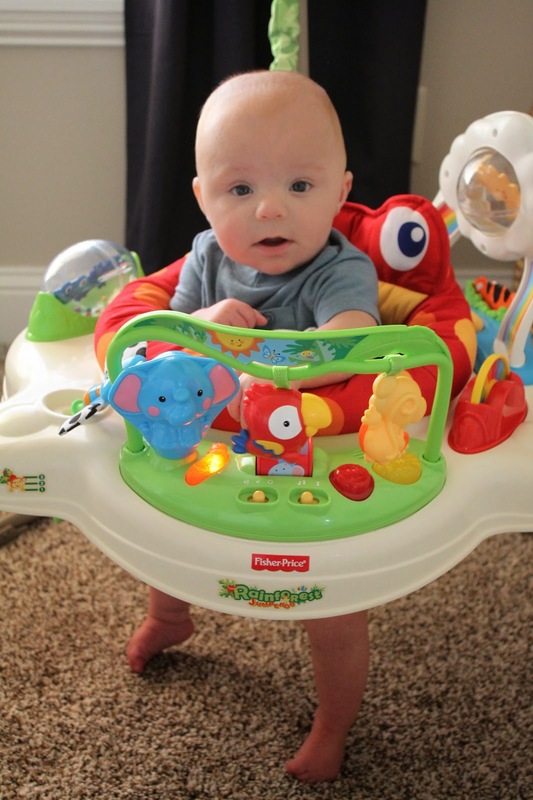 So far, C's only rolled to his side a handful of times, and has focused his attention primarily on how fast he can get his toes and his thumb to his mouth, and pointing his legs out as straight as they can go. 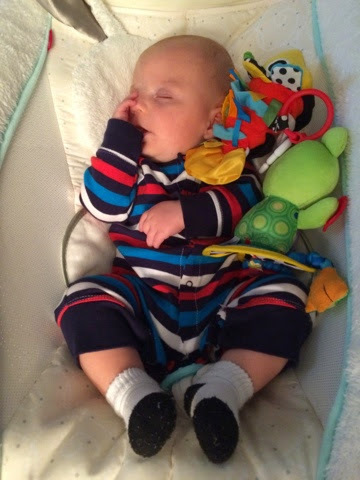 One of the most adorable observations of the month is his praying. At nearly every meal, he locks together his little fingers into praying hands. Such a cutie. C got his first taste of real food...A.K.A. oatmeal...the last day of being a four month old. HE LOVED IT! Until then he had been 100% breastfed minus a few days of supplementing when we first brought him home. While being unable to leave him for more than 2.5-3hrs at a time is not always the most convenient, not having to worry about bottles and other baby food so far has been about the best thing ever. Raising a newborn has enough trials as it is, and I am so thankful that I've been able to breastfed exclusively without any trouble. I don't really have a concrete plan for future breastfeeding plans, but I'd like to try to continue until C reaches his first birthday, or he decides on his own that he is done...whichever comes first. 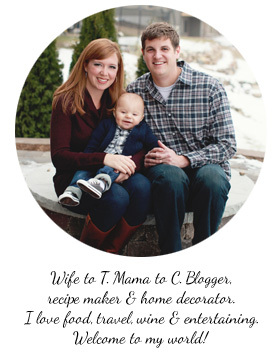 My biggest concern is trying to figure out the dynamic of how to introduce solid foods while continuing to breastfeed. 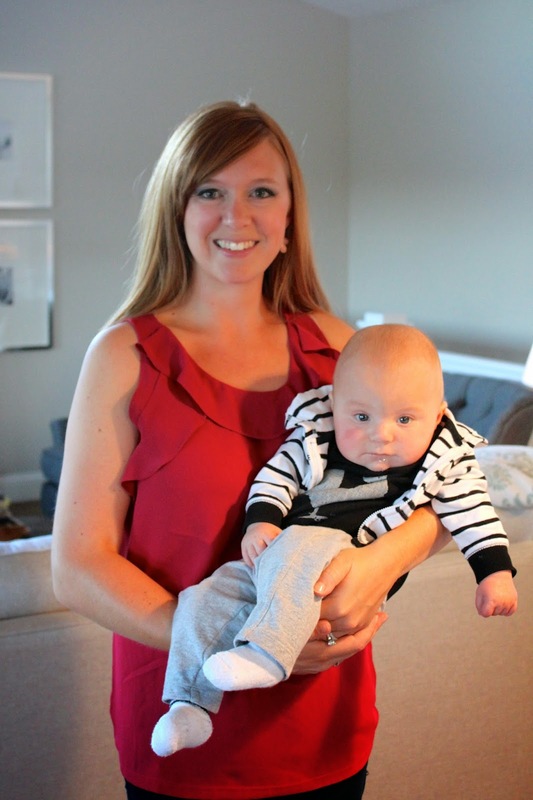 Pumping has been very difficult for me, so the idea of mixing breast milk with solid foods won't really work. If anyone has any great resources they'd recommend on this topic...please share! 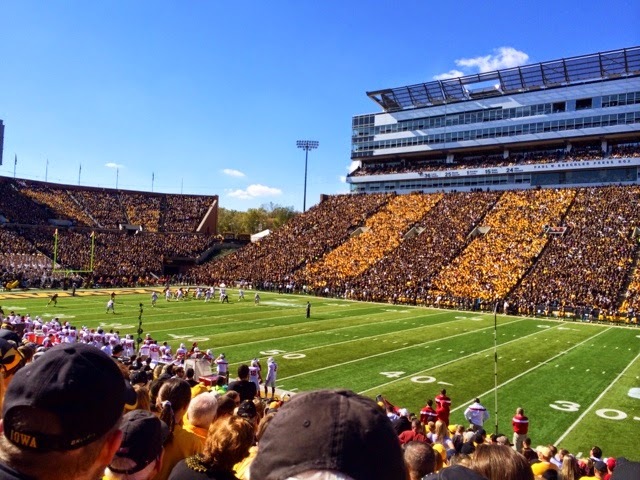 Saturdays this fall have been filled with football and cheering for the Hawkeyes. 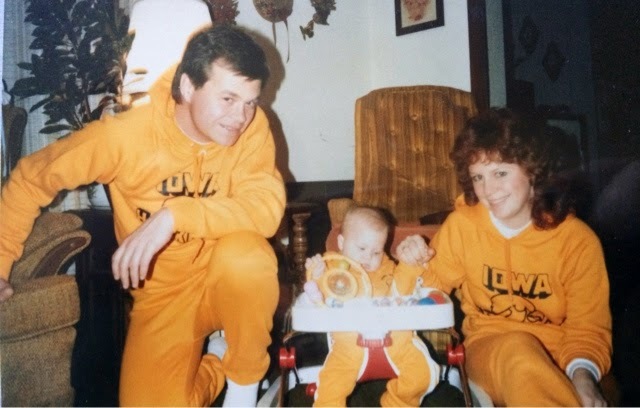 In a throwback version...T & I are in serious need of some matching Iowa Hawkeye sweatsuits to recreate this awesome picture from when I was a baby about C's age. CLASSIC. 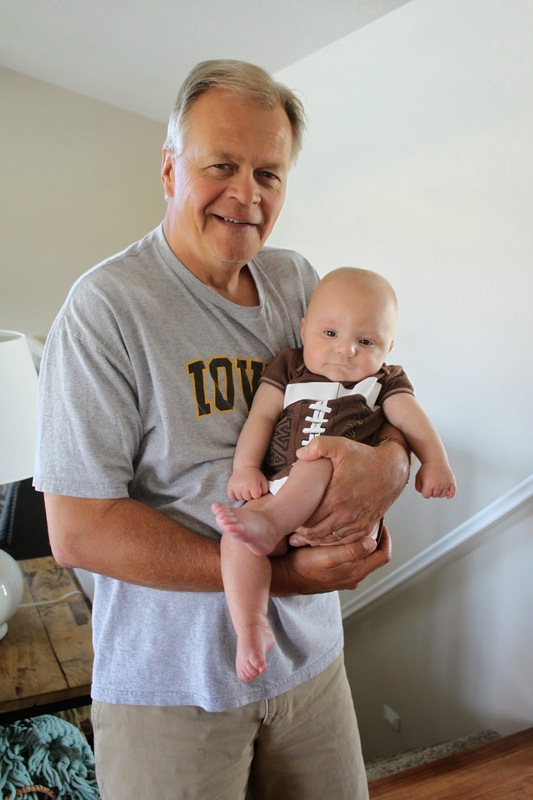 Grandpa T & C hanging out on game day. 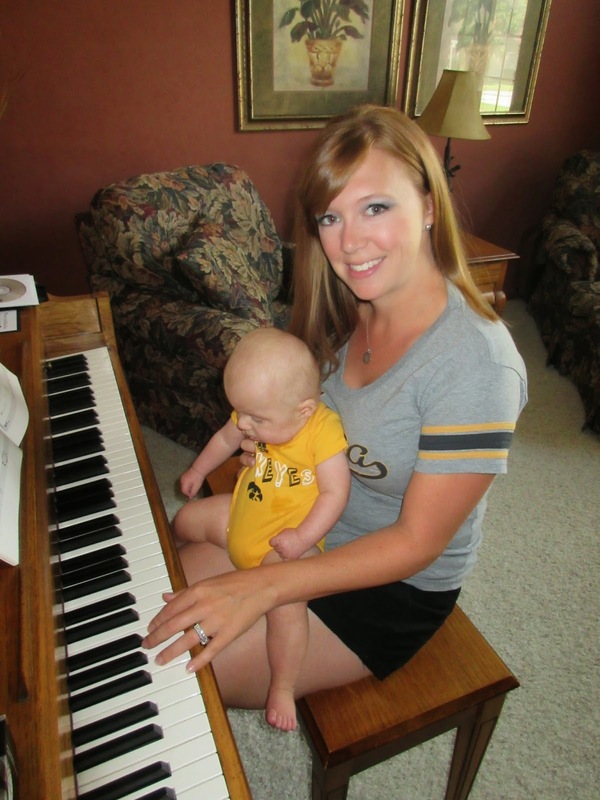 These might be two of the biggest Hawkeye fans around! 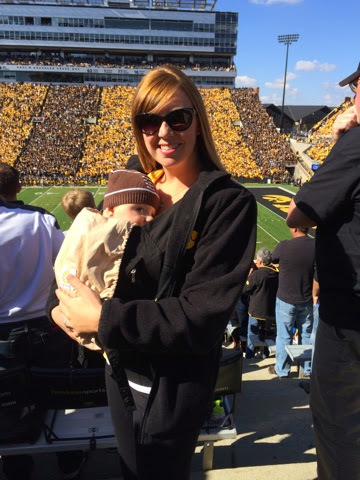 First trip to Iowa City, first tailgate, and first Iowa Hawkeye football game inside the hallowed walls of Kinnick Stadium. C's favorite part was definitely the tailgating. He couldn't keep that great big grin off his face the entire time. 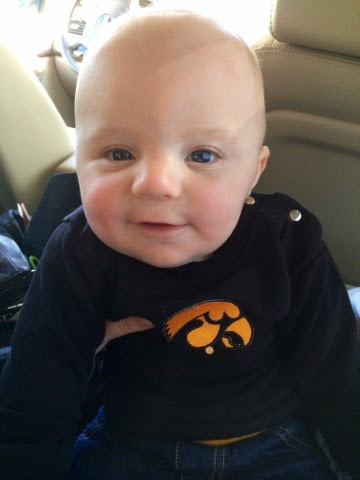 Born a Hawkeye for sure! Our Saturdays this fall have been packed with football, and it's very likely that C will think that football is the only thing the TV is for since we don't watch during the day, and usually keep it off or on a music channel before C goes to bed at night. Nothing wrong with that! 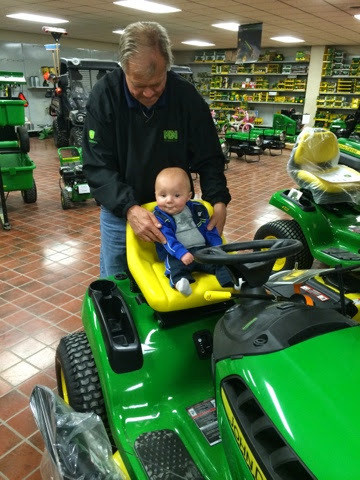 The weekend started with a trip to my hometown and a surprise visit to John Deere to visit C's great grandpa K, grandpa T, and uncle T. Harvest is in full swing, but Grandpa T still managed to find some time to let C 'drive' a lawnmower in the showroom and peruse ALL of the John Deere toys. As you can tell, C was very impressed with all of the fun things to see at John Deere. 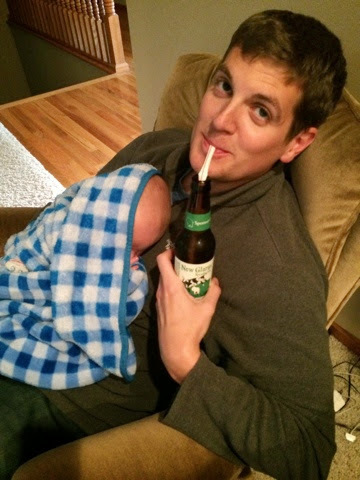 T trying to calm C while drinking a Spotted Cow from a straw so as not to disturb the moment of calm. Friday night we after ordering pizza from hometown favorite Pasquale's and catching up with one of my best friends, we headed to Uncle T's football game under the lights at Mason Maach Field. C threw a fit for about an hour before we arrived, but was fine once we got to the game, and we were able to stay until almost the end. Uncle T had another touchdown right as we walked in, so we're still thinking C must be good luck! 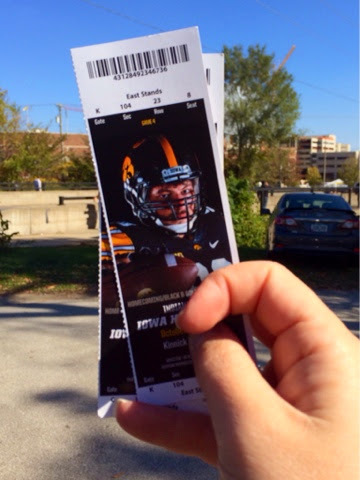 After the game, we packed back into the car and hit the road for the best town in the state...Iowa City. It's been awhile since we did much late night traveling, but C did great on the 3 hour car ride, and slept the entire way there. After getting the pack'n'play set up at Uncle N's, C went right to bed without a fuss. 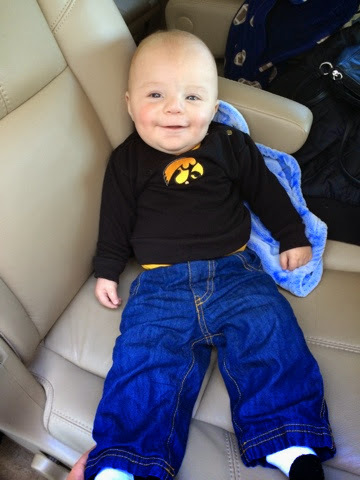 Saturday morning we were up bright and early, AKA about 8:15 when C got up, to head to C's very first Melrose Avenue tailgate for Iowa's Homecoming game against Indiana. 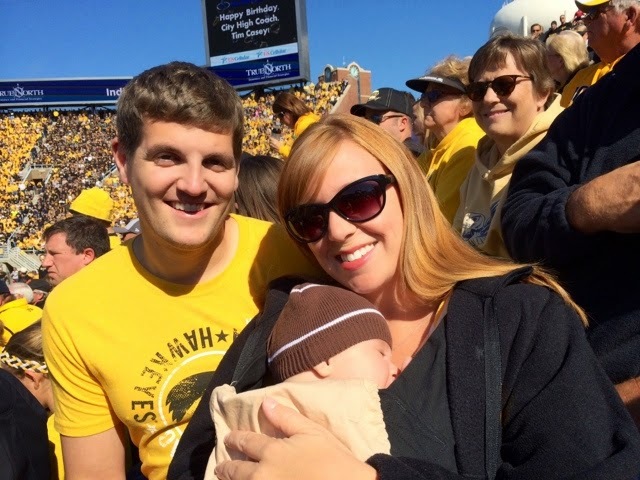 When we ended up having extra tickets and C wasn't too fussy, so in a last minute call, we decided to take him to his very first game at Kinnick Stadium. Unfortunately, we didn't realize he would need his own ticket, so after scalping away all of our extras, we had to scalp one back for C. Ridiculous! $20 well spent. 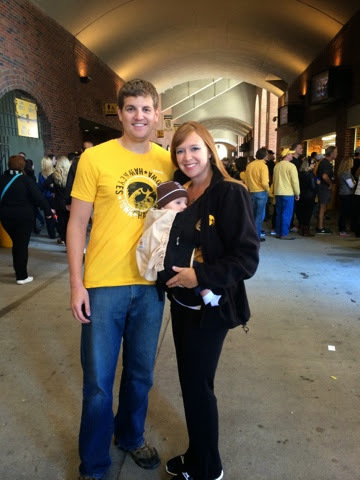 Taking a 4.5 month old to a game at Kinnick Stadium. Priceless. I'm not sure who was more excited about going to the game. T, who had no intention of not going, and never even considered staying with C so I could go to the game; myself, who thought there was no way I could go to a game this year; or C, who really could care less, but enjoyed some new scenery and being outside. It was a beautiful day, and I'm sure if C could remember it, he'd likely chalk it up as one of the best days ever. After a whirlwind shopping trip on the way home Sunday, most of our Monday looked a little something like this. Cheers to college football weekends!